07:00 – Breakfast at the hotel . 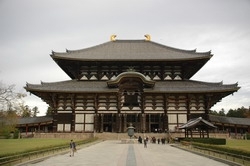 10:00 – In the lobby you will find a guide and tour to Nara! The city of Nara is the ancient Japanese capital (710-784. 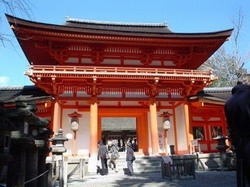 ), And is considered the cradle of Japanese culture and art. It is here were the main Japanese craft, tradition and science. Nara small provincial town with a population of just over 370 thousand. Man. Life here runs smoothly and steadily. The first imperial capital of the country – a real open-air museum, where there are the most important Buddhist buildings. Todai-ji Temple – the largest wooden building in the world, under its arches sits a giant bronze statue of Vairocana Buddha – the largest Buddha statue in Japan. The temple was built in 710-84 years by decree of Emperor Shomu. In those ancient times, Japan embraced disasters and epidemics. 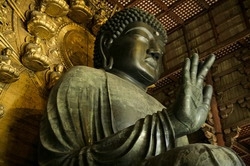 Shomu emperor ordered the inhabitants to build a statue of Buddha, which is able to protect them. Then participated in the construction of 2.18 million people. Statue height of about 15 m, weight 500 tons. Today Temple Todai-ji Temple is the object protected by the UNESCO as a World Heritage Site. 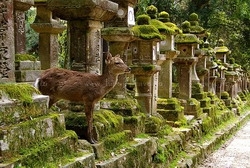 On the territory of the temple complex there is a large number of unique facilities, as well as the park where the lives of more than 1,500 tame deer that are considered “divine messengers”. The fact is that according to legend, once upon a time the first Japanese emperor was in Nara deer – And from the sky. 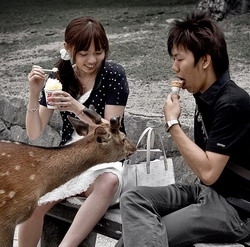 Since then, all the descendants of deer revered Japanese and live in many gardens and parks of the city. Note: power are asked not to feed the animals everything that comes to hand, for this many stalls sell special food. 14:00 – Continuation of the tour. It’s nice to walk around the park, go deep into the forest, where there are Japanese kleptomelii. Go through the souvenir shops, you can buy knives, swords, made ​​by Japanese masters. Kasuga Taisha Shrine is a major Shinto shrine in Nara. It was built in 768 in the foothills of Mikasa and Kasuga, from which once descended the Shinto gods. Within the complex are many buildings declared National Treasure of Japan. According to Shinto tradition, from 8 th to 19 th century, the church structure rebuilt every twenty years, leaving them unchanged architecture. Kasuga Taisha Shrine is famous for its lamps, of which there are more than 3, 000, each donated by pilgrims who came here over the centuries. If you want to see one of the wonders of Japan – the night lighting of fires, it is necessary to arrive at the shrine Kasuga Taisha Shrine at the beginning of February, when celebrating the arrival of spring, or in mid-August – the Day of All Souls. These days, throughout the church candles in thousands of lights. In other wonders of the sanctuary are eight hundred thousand years of wisteria and cedar. The garden Man’yo collected hundreds of plants and flowers. There is here and imperial apple, but she is much younger – it gave the sanctuary of the emperor’s family in 1957 to replace the lost the first apple trees, which were planted here in the twelfth century. The imperial family and high-ranking officials of the country often visited the sanctuary Kasuga Taisha in preference to many other shrines. Kleptomelii, mountains, mild climate create comfort for your body, the beauty that surrounds you caress your dushu..Vsё it will leave forever in your memories of this wonderful world of Japanese.